Includes tab and detailed notes. Volume Two focuses on two- and three-finger techniques, some of which are the foundation for contemporary three-finger style. Each segment features a complete performance of a song or tune, comment on its style and source, and detailed split screen instruction for playing it. 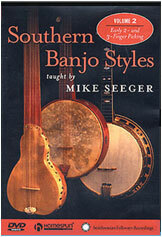 Also shown are close-up views of each of the nine banjos used.